Belkyra /Kybella is a non-surgical treatment for improving the submental appearance due to fat accumulation. Belkyra (known as Kybella™ in the U.S.) injections was introduced to Canada as the only Health Canada approved non-surgical treatment that specifically targets and eliminates stubborn fat permanently (submental fat) below the chin, also referred to as “double chin”. Fat accumulation in this area is usually quite difficult to lose even with significant weight loss. 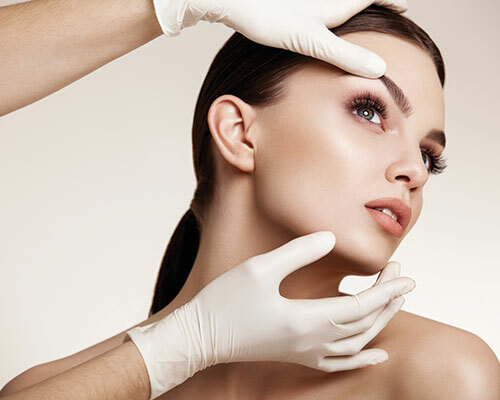 Until recently, liposuction was the mainstay treatment for improving the submental contour or profile. Belkyra/Kybella is the first injectable product approved by Health Canada to treat the stubborn “Double Chin” in both men and women. Double chin fat can be caused by genetics, age, diet and other factors, with Belkyra/Kybella you are able to target those fat cells without surgery. This quick and effective injection targets the submental fat to help improve the appearance of the chin area and reveal a more youthful sculptured jawline/chin. Belkyra/Kybella contains an active ingredient called Deoxycholic Acid. Deoxycholic Acid is found naturally in our own bodies; making this treatment extremely safe. The purpose of this molecule is to aid the breakdown of fat and disrupts the cell membrane of the fat cells. Once the submental fullness is injected, fat cells that causes a double chin are destroyed and are unable to store or accumulate fat. 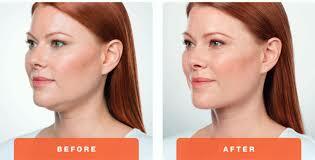 The result is a more streamlined and improved contour along the jaw line. How are Belkyra/Kybella Injections Performed? While this is a non-invasive procedure and you can return to your daily activities immediately afterward, you may experience some redness, bruising and swelling for a few days afterward. We suggest that you schedule your treatment near the end of the week, or over the weekend. We will apply either a topical analgesic, or give you a local anesthesia injection to make your Belkyra treatment more comfortable. Then we’ll place a transparent grid onto your chin that will act as a guide for your injectionist to follow to ensure accuracy, and increase the probability of smooth, balanced results. Based on your own needs, our injectable specialists will work with you to create your customized Belkyra/Kybella treatment regimen. Each session will be spaced apart by one month or more. Typically, 2-3 treatments are required, depending on the amount of fat in the area and your desired chin profile. Belkyra/Kybella causes the destruction of the fat cells. Once the aesthetic response is achieved results are permanent, re-treatment is not expected, as those cells can no longer store or accumulate fat. The treatment only takes a few minutes, and you can be on your way! The injections are performed in the office and take 15-30 minutes to administer. If you experience any discomfort, you can apply an ice pack for 10 to 15 minutes afterward. This will also help reduce swelling. All of our body’s cells have a special outer layer of fat to control what goes in and out of them, known as a lipid membrane. Belkyra/Kybella is a medication that breaks down fat cells, and is actually the same type of chemical that our livers produce naturally and that gets released by our gall bladder to break down the food we eat. When fat cells are exposed to Belkyra/Kybella they are dissolved. Belkyra/Kybella is injected with a very thin needle into the fat that creates the double chin. Medically, this area is known as submental pre-platysmal fat. After 4 to 6 weeks you will have a follow up consultation to assess the initial treatment’s level of fat loss. Most patients require 2 to 3 treatments for optimal results, but individual goals will be discussed further with a doctor. Belkyra/Kybella double-chin removal treatment typically takes only several minutes. As with any medical procedure performed at Dermedix Clinic, your safety and aesthetic outcome are our utmost concern, and so only a medical professional will perform your non-surgical lipo procedure. The procedure does not leave any indication that it was performed and you may go about your day right away. Who should not have Belkyra/Kybella? Belkyra/Kybella should not be used in pregnant or lactating women, as well as people who have had a previous allergic reaction to the drug or any of its ingredients. People with blood, neurological, or immune system disorders must discuss whether they are able to undergo this treatment with the doctor. Can people tell I have had Belkyra/Kybella? The procedure is minimally invasive and most people can leave the office and go about their day without anyone noticing they were treated. The area injected will swell and may bruise slightly. This typically lasts for one week. Over the next 2 to 6 weeks the fat cells under the chin will be broken down by the body, resulting in a more sculpted and shapely jaw, chin, and neck. When our weight fluctuates with diet and exercise our fat cells shrink when we are burning more calories than we eat, or grow when we eat more than we burn. In contrast, Belkyra/Kybella dissolves these fat cells, so they can no longer store excess fat. What happens to the Belkyra/Kybella once it is in my body? Belkyra/Kybella is a similar molecule to one that our liver creates and gallbladder excretes when we eat fatty foods (deoxycholic acid). After it is injected, Belkyra/Kybella also gets stored in the gallbladder and is used to help digest food like its natural counterpart. Is there any downtime with Belkyra/Kybella? No. You can return to work and most daily activities immediately after your Belkyra/Kybella treatment. We do recommend you avoid very strenuous exercise for a few days afterward, though, as this may increase bruising and prolong swelling. What are the potential side effects of Belkyra/Kybella? The most common Belkyra/Kybella side effect is swelling, which can last up to three days after your treatment. You may also experience some bruising, itchiness, redness, and general discomfort. Some patients also experience numbness or tenderness in the targeted area, in some cases for up to two months. If your job requires you to deal with the public (or if you just don’t want anyone to know you received a cosmetic treatment), you may want to schedule your treatment toward the end of your work week to give the redness, swelling and bruising a chance to dissipate before you go back to work.